Like consumers investing in a pair of body-shaping jeans, the National Science Foundation (NSF) invests in basic research and people to mold the future. So, the government agency awarded more than $500,000 to the University of California San Diego and the University of Texas at San Antonio (UTSA) to study, for the first time, the exploration of the electronic and magnetic behavior of one-dimensional (1D) metallic chains. In this case, these are ultra-short chains of atoms that can be fabricated using organic molecules called metallo-phthalocyanine (MPc)—flat molecules with a metal atom at the center commonly used in dyes present in the color of blue denim. The findings could lead to the development of new, smaller and faster electronic devices that can be used in computer memory, as well as to promising careers for future scientists. Led by UC San Diego’s Distinguished Professor of Physics Ivan Schuller and his colleague Carlos Monton at UTSA, the joint study, co-funded by two NSF programs: Condensed Matter Physics and Solid State and Materials Chemistry, brings together two university research groups whose culturally diverse teams of scientists will work to understand more about the magnetic behavior of 1D systems. The study titled “Collaborative Research: Quantum Spin Chains. Extent and Persistence of Magnetic Interactions as a Function of Length and Spin,” features Schuller and Monton as co-principal investigators, and Nicolás Vargas, a Chilean postdoctoral scholar at UC San Diego as the expert in the fabrication of these chains. 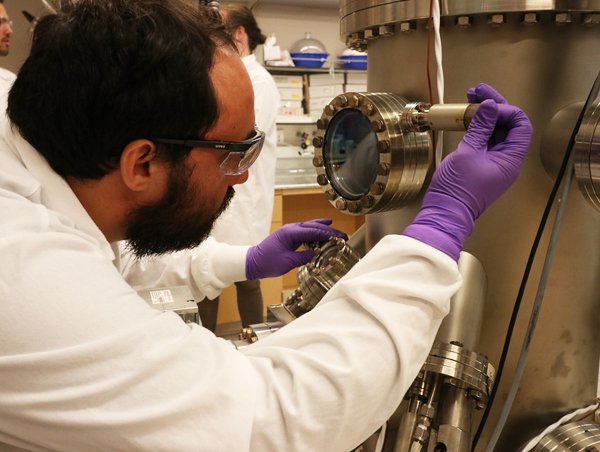 Schuller, an award-winning physicist originally from South America, notes the multicultural diversity of his Nanoscience Group at UC San Diego and of Monton’s group at UTSA. The international scientists will focus on three fundamental issues as they make 1D, ultra-short (seven to 200 atoms long) magnetic chains, testing theoretical models and exploring emerging new magnetic properties: 1) the extent magnetic behavior as a function of the chains’ length and defects, 2) the modulation of the spin along the chains and 3) the emerging effects from variations in the composition of magnetic/non-magnetic chains. To achieve their objectives, the researchers developed a novel fabrication method of macroscopic arrays of 1D chains that allows precise control of their length, composition and spin. By substituting many metal ions (e.g., iron, nickel, copper, cobalt and manganese) into the MPc molecules, the scientists expect to yield many isostructural compounds with different spin configurations and physical properties. “This project gives us a great opportunity to discover unique properties and understand fundamental problems of low dimensional magnetism,” said Vargas, who developed a way to fabricate and measure ultrashort low dimensional magnetic chains. In addition to the innovative science, the cross-cultural, cross-institutional project includes an active educational/career-forward component that enables graduate students to conduct research for their Ph.D. thesis topics. 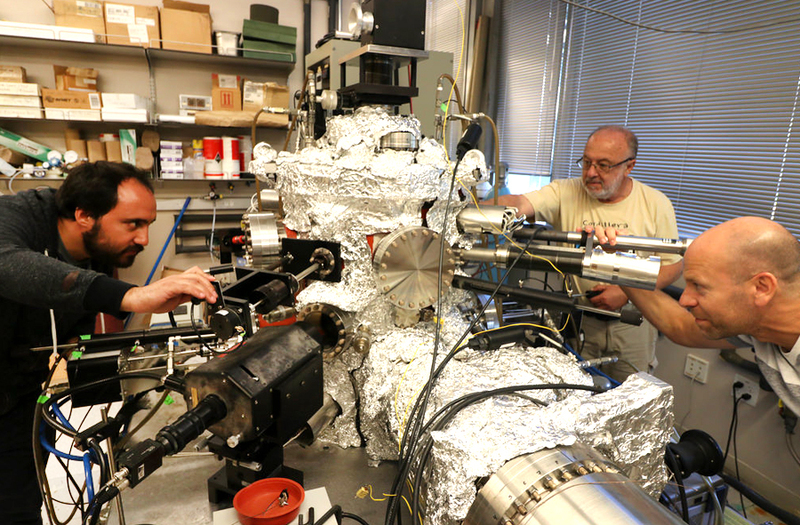 The funding also supports collaboration among several physics undergraduate students, who will receive training at specialized facilities, gaining exposure to state-of-the-art, experimental techniques which include: ultra-high vacuum systems, fabrication, X-ray diffraction, structural, electronic and magnetic characterization. Outreach to high school students is also part of the project. This will enhance the teenagers’ scientific knowledge and their teachers’ repertoire of instructional tools. This research is funded by the NSF (grant nos. 1805585 and 1804414), and any opinions, findings and conclusions or recommendations expressed in this material are those of the author(s) and do not necessarily reflect the views of the National Science Foundation. At UC San Diego, we prepare the next generation of global leaders to channel their passions into driving innovation, fueling economic growth and making our world a better place. The first students to enroll at the university in 1960 were graduate students in physics.